Lainaan tähän Nippurin kirjastosta löydettyjen savitaulujen keskinäistä järjestämistä koskevan kohdan teoksesta Sumerian Texts, Ch. III Myths of Kur. (1944, 1961). Kappaleen kirjoittaja on sumerologian kuuluisa pioneeri, professori Samuel Noah Kramer (1897-1990). The 14 tablets and fragments illustrated here furnish a historical commentary on the reconstruction and translation of the myth "Inanna's Descent to the Nether World," recently published by the author. The arrangement of the plate is aimed to illustrate the process of piecing together the tablets and fragments utilized in the reconstruction of the poem. Nos. 1, 2, and 5 were published by Poebel in 1914. Nos. 3 and 4 were published by Langdon in 1914. No. 6, which is in the University Museum, was identified by Chiera as the lower half of the very same tablet whose upper half, no. 3 on our plate, had been copied by Langdon in Istanbul. Chiera's discovery enabled me to publish my first reconstruction of the myth in 1937. Nos. 7-9 were published by Chiera in 1934. Nos. 10-12 were identified and copied by the author some five years ago in the Museum of the Ancient Orient at Istanbul. Nos. 13 and 14 were identified and copied by the author recently in Philadelphia. The utilization of these five newly discovered texts made possible the edition published in 1942. The marked passage on no. 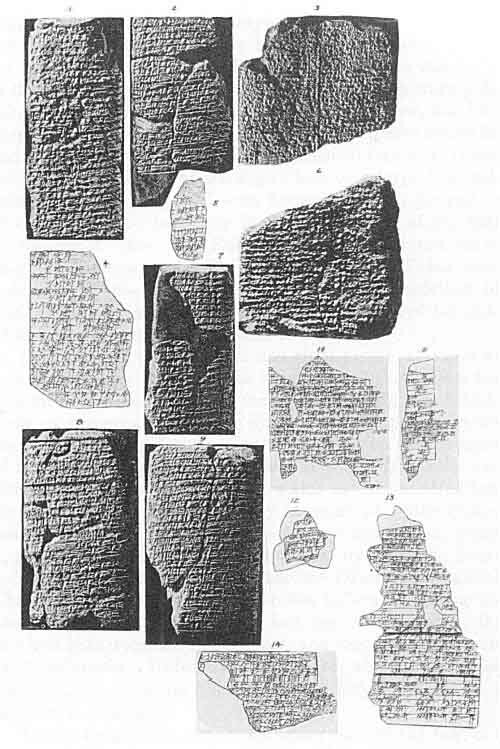 8 contains the lines describing Inanna's decision to descend to the nether world; that on no. 13 contains the lines describing the death of the goddess; the reverse of no. 10 (not on our plate, which contains the obverse only) has the resurrection passage. The transliteration and the translation of these three most significant passages will be found in note 87.